You are all probably wondering how in the world I’m going to fit this into my already bulging baking schedule with Heavenly Cake Bakers and Tuesday with Dorie. But, since this is a post that will happen only once a month and I’m super-dupper organize, with my baking calendar I'm totally covered. So much so, that I’m posting my first post with the ABC group a WHOLE DAY LATE of the DUE DATE! See HOW ORGANIZED MY BAKING CALENDAR KEEPS ME? Yeah, lets move on… see the pretty fruit? 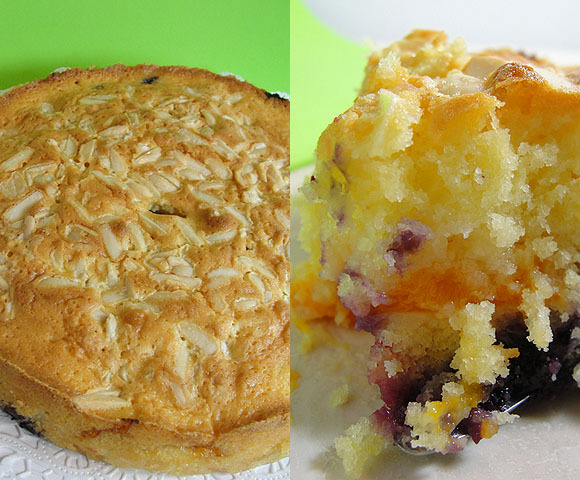 The choice for this month was the Apricot-Almond-Berry Buckle. Which made Tom all giddy and stuff, because you know. it had fruit in the cake. Once I got pass that fact, I set out to find out what the hell was a "buckle", and why a belt have to do with baking? Did I have to wear pants with a buckle during the baking process? This was an important question, so I needed to hunt down a bit of baking history. It turns out that this type of dessert goes back to Colonial times, when settlers were very good at improvising by searching for ingredients to make their favorite dishes from their original country of origen and then naming them based in how they looked or how they sounded when they were served or cooked. A buckle (or crumple) is a cake made in a single layer, with berries mixed into the batter. The batter is quite thick, and as it bakes, it forms a thin bottom layer. The topping is similar to a streusel, which gives it a buckled or crumpled appearance. Other notable reasons is that the fruit sinks to the bottom during the baking process and thus the top "Buckles". I can tell you this, those settlers were a barrel of laughs. And that folks is your baking 101 of the day – you are welcome. Since I did not have the necessary fruits that the recipe asked for: Apricots, raspberries and boysenberry, and I needed to plan a trip to the market. Monday it rained, hard, I got lazy, so I moved the whole thing to Tuesday. But, when I told Tom that, he showed up after work, with the necessary ingredients (Apricots and blueberries, no luck on the raspberries and boysenberry) on Monday night. I could not come up with one solid excuse to still bake it on Tuesday. On the plus side, I think, I may have found a sure way to get him to go to the supermarket in the future. The batter is a walk in the park to make. In fact it took me less than 20 minutes to put this together. I cheated of course. Flo tells you to have all of the ingredients at room temperate and I used some a lot of baking shortcuts to accomplish this task. Using the microwave to bring the butter to room temperature, placing the eggs in warm water for 10 minutes and totally ignoring the whole thing with the sour cream and milk and using those straight from the cold refrigerator. There was no major difference in the final product. But the best part of this cake is the fact that everything goes into ONE bowl. No multiple bowls or multiple steps - You measure and dump in the mixing bowl – done and done. Mix it up, and with a spatula fold in the quartered apricots and chosen berries, pour the batter into the baking dish and then cover the whole thing with a prepare “topping” of almonds coated with sugar and egg whites. In the oven it goes for 55 to 60 minutes. Mine was ready after 1 hour. While it is recommended to serve it warm or at room temperature we did not get to taste it until the next day. It was a total hit with everyone that had a piece. Tom and my mother loved it. My neighbor took one look at the almond top and without even tasting it told me that he loved it already. (Apparently his favorite flavor is anything that has almonds in it). Since it has been fully documented here in this blog my dislike of desserts with fruit, or as Tom’s puts it “you are afraid of fruit” this cake did not appeal to me. Nevertheless, I took a quick taste of the cake portion, which was delicious. Moist and tender with a great almond taste. No, it was not enough for me to try a FULL PIECE with the fruit. Regardless of my preference the proof is in the pudding and this cake lasted on top of my kitchen counter a total of 48 hours. That pretty much tells you how popular it was. For other takes on this month’s choice you can visit the other ABC Bakers over at Hanna’s Kitchen. Disclaimer: No recipes are shared in my ABC posts, due to restrictions in sharing the recipes by the publisher. But, you can purchase the book here.